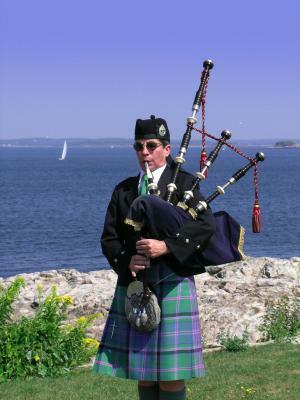 The word Bagpipes has almost become synonymous with Scotland, and in particular the Scottish Highlands. The Great Highland variety is far and away the most famous of all. There are in fact dozens of types being played across many parts of Europe, the Middle East and much of what was formally the British Empire. Over the last few centuries the use of many traditional types around the world had virtually died out, but they have seen a resurgence in the last few years, due to traditional musicians having sought them out. Below you can see a photo of a set of Great Highland pipes made from rosewood, they are about forty years old. A good example of this is Irish piping, which had declined to only a handful of master players by the middle of the twentieth century, but today it is alive and well, indeed it is flourishing. Scottish Highland regiments have of course become very famous for their pipe bands, and within the Great Highland piping community the number of bands registered with associations across the world runs into many hundreds. With each band averaging between ten and twelve pipers, it is estimated that there are somewhere between ten and fifty thousand pipers worldwide playing the Great Highland variety. If you then include all the other various forms of the instrument, the total number of musicians playing the pipes is huge and the future of pipe music seems assured. If you have an interest in learning to play this fascinating instrument, and would care to visit the web site of one of the worlds leading pipers, then please follow the link below. Another wonderful bonus of this particular musical instrument, is that every time you see and hear them being played, you have the chance to see both kilts and pipes together in one place. And of course its not only pipe bands who play the pipes, you will also find wedding pipers are becoming very popular. For those of you who are unfamiliar with the instrument, it consists of a bag a chanter and a drone, which when combined give the unmistakable skirl of the pipes. The bag is of course the air supply, which is constantly being filled by the piper as he or she plays the instrument. The chanter is the melodic part which supplies the notes, by means of covering and uncovering the holes with the fingers of both hands. And finally the drone, which is normally a cylindrical tube which incorporates a reed, the drone is typically made from tropical hardwood. The earliest reference to them occurs around 400 BC, and the Roman Emperor Nero was said to have played the instrument. Its first appearance in Scotland is recorded in Pictish carvings from the eighth century. While in 1314 Robert the Bruce's troops marched to the Battle of Bannockburn to the sound of the pipes. So all in all one of Scotland's best loved sights and sounds, are going from strength to strength with associations worldwide reporting continued growth. 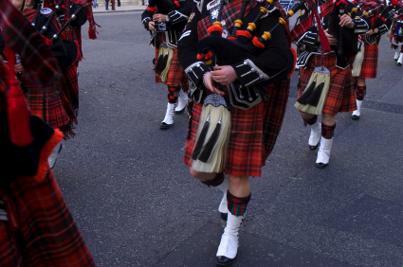 And the pipe bands will continue to attract new young players as the popularity of the instrument continues to grow around the world, therefor continuing a tradition that has spanned many centuries.